Leah and I were a little lazy today, and wanted something extra fast, tasty, and easy. 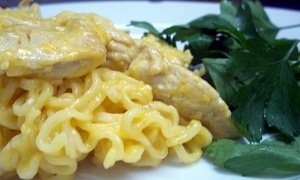 So we went for some chicken with ramen noodles, and added some home-made hollandaise sauce. There are a few steps in this recipe, but its not very hard at all. The only “tricky” part is making the hollandaise sauce, keep the heat low so you don’t scramble the eggs. 1) Separate egg yolks into a small dish. 2) Wisk juice from 1/2 lemon into the egg yolks. 3) Add yolks to a frying pan over low heat, Slowly add warm butter to the egg yolks, wisk as you add the butter. Do not add all the butter at one time, pour a little at a time and wisk as you add it. 1) Cut chicken into small strips. 2) Season chicken strips with 1/2 ramen noodle seasoning packet. 3) On medium-high heat fry chicken and a spoonful of butter. 4) Fry for 2-3 minutes then flip. 5) Fry for an additional 3 minutes. 6) Prepare ramen noodles per packet instructions. Do not use seasoning. 8) Combine noodles, chicken, hollandaise sauce and the remaining 1/2 packet of ramen seasoning and stir together over low heat. If you enjoyed this recipe, please consider sharing it! This is such a lovely simple recipe! I live in a college hostel and i toned down on a few ingredients to suit my cooking skills :p will definitely try this out when i’m home with my mom! !